ALIAS is a module of IDS Logic which is available to IDS Project members. ALIAS contains all of the article holdings and licensing information from IDS Project member libraries. 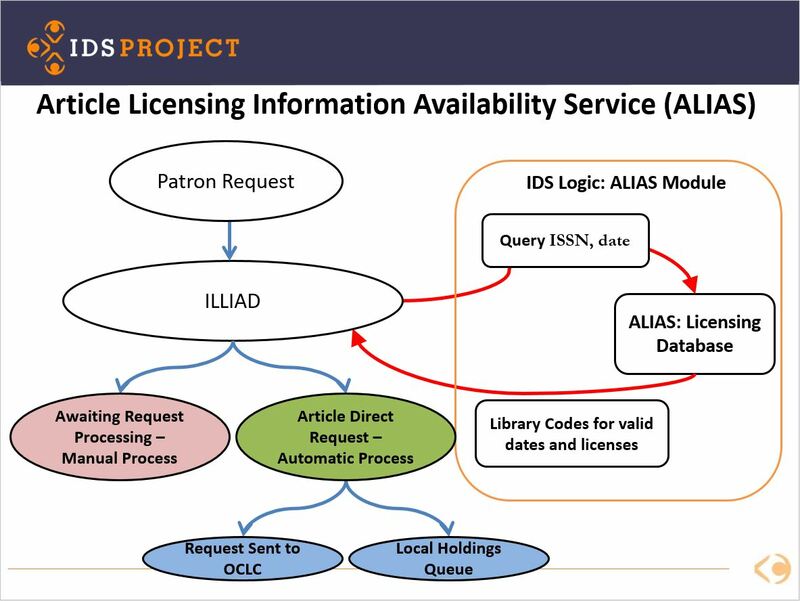 Based on article holdings (both electronic and print) and licensing information, ALIAS develops a list of lending libraries that can fill borrowing article requests within the IDS Project membership. Like Direct Request, this can free up an average of 10 to 20 hours of processing time and decreases the turnaround time for article requests—especially since ALIAS promotes electronic over print holdings. Unlike OCLC’s Direct Request, ALIAS also performs load leveling. Currently 93 IDS Project member libraries have ALIAS installed and running through Logic.